! I would very much like tae thank Norman Anderson Fae Dufftown for looking oot his auld glass slides (I kid ye not!) and letting me copy them so that abidy kin a hae a keek at them. The first picter comes fae a mannie fae Aberdeen . 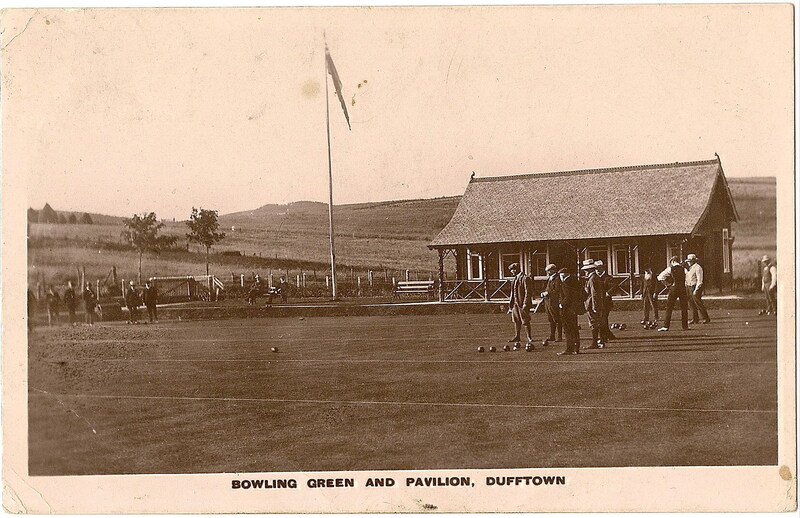 In ahin the bowling green is now a' hooses. nae sign o' Tininver street or Tominudh road, this was taken a whilie afore that. 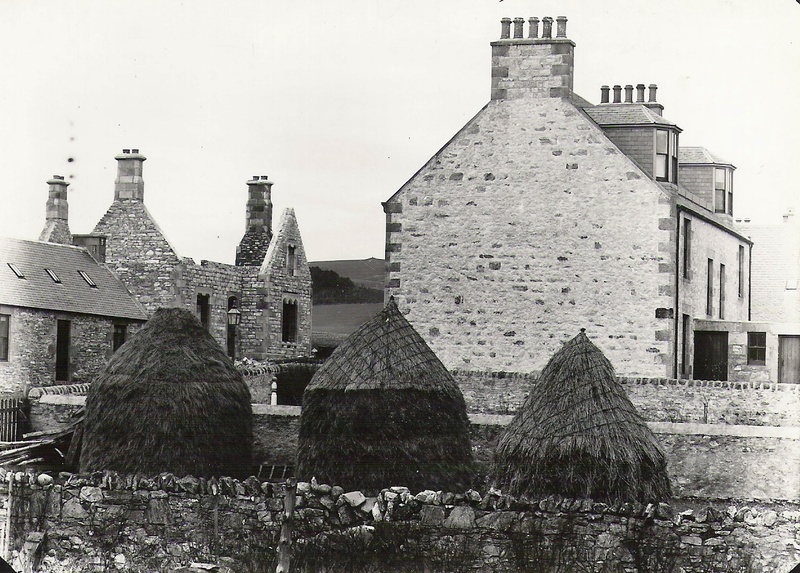 Here were in to Normans picters and far the stooks are is noo the Memorial Hall. The auld registrars hoose is jist in the middle o getting biggit. Next up is a gey speckley picter o Mortlach Distillery wi maist o Dufftown ahin. Far the dam is on the left, is noo a turning circle for larrys. Here is the old Butcher on Balvenie street far the bookshop is noo. This steen in the next picter can still be seen if ye hae a walk roon the Maisters Wid jist off Church street. This is where Balvenie Distillery is noo. I think I mine hearing they latterly used this big hoose (The New Castle of Balvenie) as a malt barn and shovelled the malt oot o the front door. Thanks go to Grant Mercer for this information! Grants father Harry was once Clerk to the society. next up is the meenester and his household. 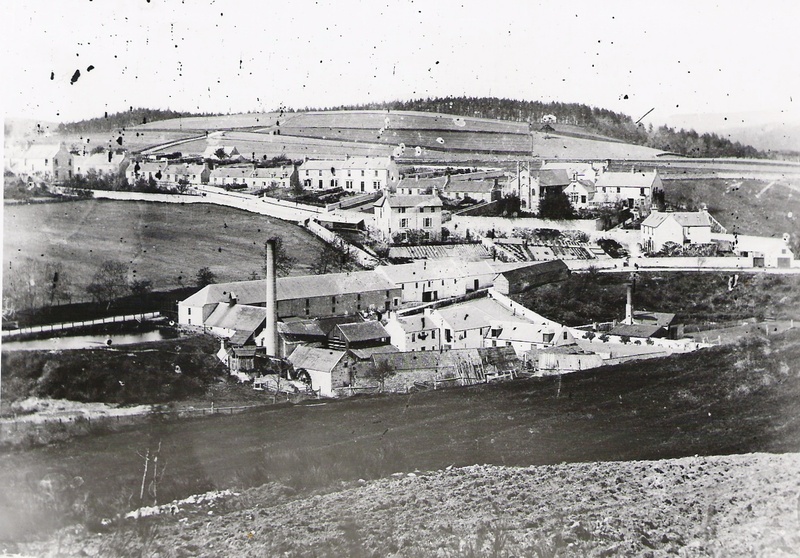 Now this landscape is totaly changed big hoose which was the new Castle of Balvenie is the same ane fae a puckle picters back and Glenfiddich distillery occupies maist o the area in front noo. Here is the massive organ that used to be in Mortlach church, I bet it had a rare tone. This is taken when the King was oot for a run. The clock tower (above) has the original black clock face re. This was replaced by an illuminated glass fonted one to commemorate the reign of Queen Victoria . John Flemming from Church Street Dufftown mentioned that the arch put up to celebrate the opening of the Stephen Hospital. There was another one put up near Blinkbonny.